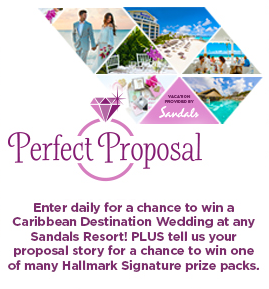 Hallmark Channel’s Perfect Proposal Sweepstakes – Win a Caribbean Destination Wedding at any Sandals Resort! Win a Caribbean Destination Wedding at any Sandals Resort! ENTRY LIMIT – Limit one (1) sweepstakes entry per person, per day, using only one (1) email address throughout the sweepstakes, regardless of method of entry. ELIGIBILITY – The Promotion is open to legal residents of the fifty (50) United States and the District of Columbia who are at least 18 years of age at the time of entry. SWEEPSTAKES ENTRY PERIOD – Hallmark Channel’s Perfect Proposal Promotion starts at 9:00 a.m. Pacific Time (“PT”) on June 1, 2016 and ends at 9:00 p.m. PT on June 30, 2016. (1): From the Prize Provider: One (1) prize consisting of a six-day/five-night Luxury Included® WeddingMoon for two (2) adults to any of the fifteen Sandals Resorts or the three Beaches Resortslisted below in Jamaica, Antigua, Saint Lucia, Turks & Caicos, The Bahamas, Barbados & Grenada as selected by winner. 4) From the Prize Provider: Grand Prize winner will receive one (1) free wedding, which consists of the Beautiful Beginnings wedding or one (1) free ReTie The Knot ceremony in the event the winner is already married. Package must be redeemed during the aforementioned stay. Approximate Retail Value (“ARV”) of Sweepstakes Grand Prize: $6,500. CONTEST WEDDING PRIZE PACKS (4): Each of the four (4) contest winners will receive the following Hallmark Signature products: two (2) gift bags, two (2) stationary notes and seventeen (17) Hallmark Signature cards. MSRP $150 Approximate Retail Value (“ARV”) of each Contest Prize pack: $150 each or $600 Total.